View cart “Peruvian Zipped Pouch” has been added to your cart. 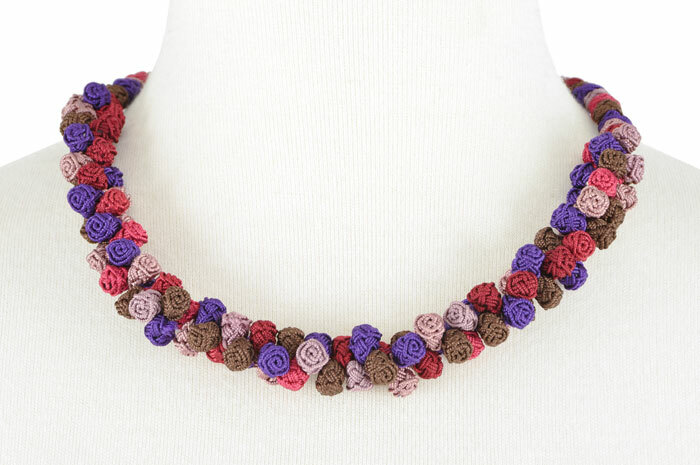 This necklace is handmade from hand-knotted buttons, a technique and skill used for the djellaba (caftan) traditional clothing. The women of the artisan cooperative in Sefrou, Morocco, make these buttons using high quality rayon. After which, they string them in a colorful array as beads to create jewelry. Most of the designs are created by the individual artisan who made it, the inspiration their own. This necklace features rounded djellaba beads that give it the feel of a string of colorful pearls. It has an easy hook closure at the back neck, and is quite comfortable to wear. The women of the artisan cooperatives in Sefrou, Morocco make these hand-knotted buttons, a technique and skill used for traditional clothing. In 2000, the Sefrou Women’s Silk Button Cooperative was formed under the Golden Buttons nonprofit and given the name Cherry Button Cooperative of Sefrou after the town’s symbol and the style of buttons made there. Learn more about Amina Yabis and the Cherry Button Cooperative. Watch ClothRoads Morocco Tour learning to make these buttons in Sefrou.